The massive world of social media provides multiple platforms to connect and collaborate with parents and peers about college application counseling. Scholarships, college visits, and approaching deadlines can be shared with a wide audience on Facebook and Twitter. To support parents, hosting a live Question & Answer session through a Twitter chat, Google Hangout, or Facebook Livestream appearance enables parents to be involved while subtracting geographic and time barriers. Online communities for parents and school counselors boost morale, offer brainstorming, and provide additional details about college applications in an informative environment. College Signing Day, a day in which students display which college they will be attending as freshmen, celebrates student academic achievement. The commemoration of college admission nurtures the next academic steps of students and acknowledges their hard work that leads to college acceptance. Wearing future university school colors in a College Shirt Day, hosting high school alumni to speak about their college experiences, or highlighting the next step in a student’s academic career creates an environment fostering college success, academic progress, and an appreciation for higher education. Parental support can be an influential and invaluable source to aid college counseling efforts. To give ownership to the process, students may consider scheduling a meeting with their parents to discuss college admission details, deadlines, and additional requirements for each school. Parent informational sessions to communicate expectations, needs, and tips help them understand how to proceed and provide support for their children. In addition, parents are able to identify schools which best suit their children in Naviance Family Connection. 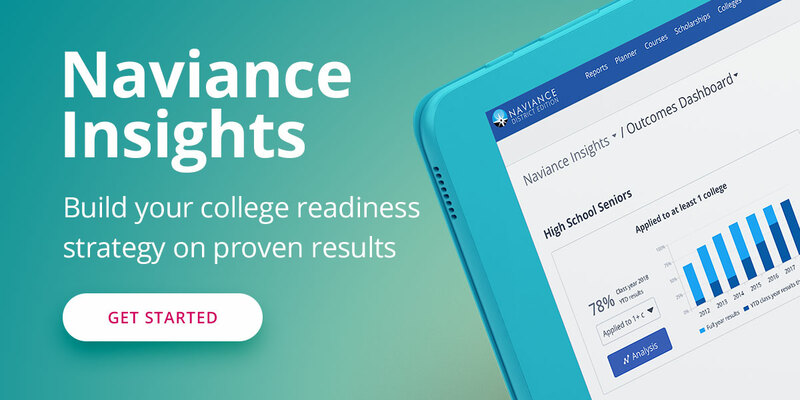 Naviance provides useful insight about educational programming, financial aid, and compares student demographic information at selected institutions. For many high school students, the college application process can be overwhelming. Counselors can host short courses to provide instruction about key aspects of college applications. Essay writing, resume writing, and standardized test tips are beneficial to high school students. Feedback is an invaluable gift, and these short meetings can help to elevate a student’s initial essay topic, address student concerns, and expand initial thoughts about the next step after high school graduation. School counselors who host college application parties receive a higher volume of students seeking assistance on their applications. Providing snacks, music, and a casual environment encourages students to stop by the school counselor office, ask questions about the college application process, and provide support for peers on the same path. In addition to providing concrete answers to college application questions, parties offer the opportunity to foster discussion about the importance of college attendance. College goes beyond rigorous classes and creates an experience of self-discovery for students. If you’re attending the 2016 American School Counselor Association conference next week, you can discover more ways to enhance your college counseling by attending our conference presentation. Kim Oppelt, Education and Outreach Manager at Hobsons, and Chelette Stephenson, Director of Counseling & Alumni Programs at YES Prep Public Schools, will present Building on Best Practices: 8 Ways to Enhance Your College Counseling Program on Monday, July 11, at 11:00 am. And, don’t forget to stop by our ASCA 2016 booth (607 and 609). We’d love to connect with you!